The traditional way to build a website is the “build-and-forget” model. The website is created in a burst of activity (and spending). There is probably some really great thinking that goes into it, but no one really knows if it will work or not. It’s then launched to the public with a flurry of publicity, which fades quickly, and then the website moves into maintenance mode. Over the years the organization invests little or no money into the website, and it begins to age. In hindsight they realize that some of the ideas did work, some were a disaster, and the rest somewhere in the middle. After years of frustration they start the process over again with another big spend. This is the boom-and-bust cycle of spending. Keeping your site secure and up-to-date is always important, but it’s especially important when your web properties contain the personal data of thousands of members, or private information that is not for the public. 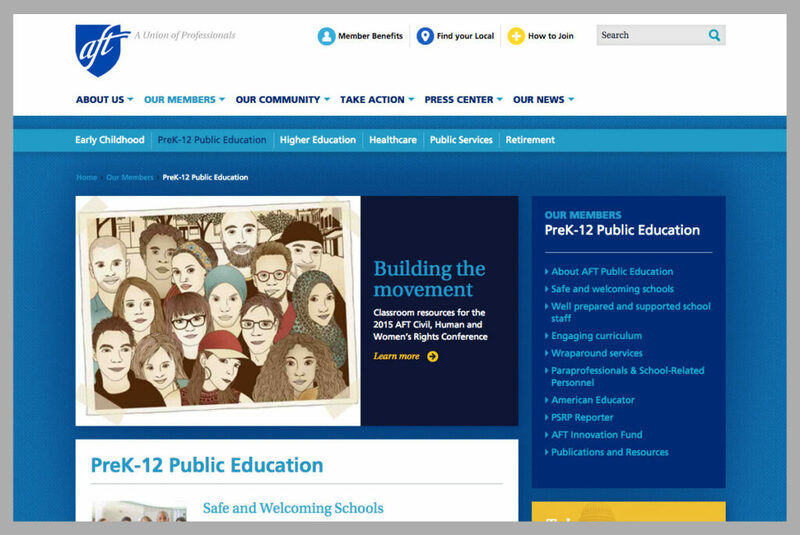 If the AFT’s data were stolen, or their public sites hacked, it would be a disaster. Because of this the AFT needs someone to keep an eye on making sure everything is up to date. But, perhaps more importantly, they need vendors that really understand security: from the big picture view of how all the parts work together, down to ensuring that individual lines of code are secure. Especially for Stateweb (The AFT’s platform for their 1300 state and local affiliates to build a website), the number of stakeholders is enormous. The AFT is always receiving feedback from stakeholders about what needs to change on their websites. By investing regularly in small changes, the AFT ensure that stakeholders remain happy. Remember the story above of how in a typical web project some of the “great” ideas turn out to be a disaster? While there are some techniques to minimize that problem, it can never be totally avoided before you launch the website. You can however respond once you realize that something isn’t working. Each of the four web properties that we built for AFT have seen at least one mini-project where we’ve either totally reworked something that wasn’t working, or added an entirely new feature. Even if you want your web property to last a long time, it isn’t just going to happen. It takes sustained focus and a strong partnership between stakeholders and developers. The AFT have been great about working with us to define the future of these web platforms. Because we know what their vision is, we can ensure that all of the little things that we do move in that direction. We also give regular feedback to the AFT about problems that we see from our unique vantage point, or problems that we foresee as the platforms evolve.